There’s an old joke: a reporter did a human interest piece on the Texas Rangers. The reporter recognized the Colt Model 1911 the Ranger was carrying and asked him, “Why do you carry a .45?” The Ranger responded, “Because they don’t make a .46.” Derisive as it may have been, that Ranger had the right idea, though today we would have to say that he was a little behind the times because they do make a .46 or, more accurately, they make the .460 Rowland. The .460 Rowland has been mentioned on Guns.com previously. Last fall Max Slowik had a great introduction to the cartridge. In December I told Santa that I wanted a .460 AR upper. And just recently I discussed an actual project to build an AR pistol in .460 Rowland. Why all the interest? 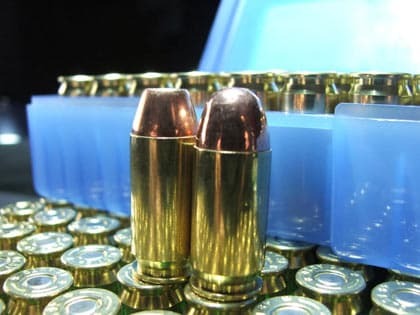 Well, because it is an interesting cartridge, and an interesting idea: to create a platform no bigger than your typical .45 ACP, but give it more knock-down power. A lot more knock-down power. Last year we did the BBTI chop tests on the .460 Rowland, using just one of the commercial loadings available for it from CorBon. And that was enough to convince me because now I’m going to state something that is probably going to give some people out there apoplexy: if you carry a .45, you should instead be carrying a .460 Rowland. I’m serious. Almost any argument I can think of for carrying a .45 ACP is actually an argument for carrying a .460 Rowland. I’m not saying that the .460 Rowland is the “Holy Grail” of concealed-carry guns. Not at all. There are still a lot of very good reasons why someone might want to carry a smaller gun, or one with greater capacity, or one that has less recoil. You don’t always have to go for the most power – sometimes other considerations come into play. I’m just saying that if you are going to tote around a gun that is large enough and solid enough to shoot the formidable .45 ACP, you might as well get the benefit of the .460 Rowland because the cartridges are the exact same overall size. The actual bullets are the same and, using CorBon ammo as an example, the .460 Rowland demonstrates about 50% more muzzle energy for any given bullet weight – and that’s compared to +P .45 ACP rounds. 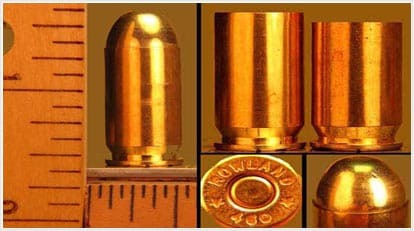 Compared to the standard pressure loads, the .460 Rowland offers almost a 100% increase. So just think consider that for a second: you can have your 1911 or your Glock 21 or your M & P or your P220 in the same size and weight. It’ll carry just as many cartridges. It’ll shoot a bullet the same size, even the same weight. Shooting full-power loads would mean stout recoil, but that’s manageable with the right combination of weight, spring and gun design. But your carry piece now shoots a more effective cartridge, one that would leave as big a hole as a .45 ACP, but have more velocity behind it. That means better penetration, more energy, greater stopping power and effectiveness, in the same package you were carrying before. The bad news is that not all of the .45 caliber handguns out there can be retro-fit to chamber .460 Rowland, but the good news is that many (and I would even go so far as to say most pistols chambered in .45 caliber) can (though you’d be wise to consult a gunsmith first, before attempting any alterations to a guns caliber). 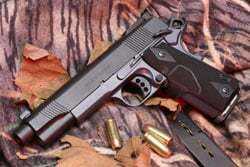 To convert your existing 1911 to a .460 caliber, it will be necessary to add a compensator as well as a new barrel (same diameter as the .45 ACP, but with a slight – though important – difference to the chambering) and recoil spring. It would also be fairly straightforward for a gun maker to design a 1911 from the ground up to handle the higher-pressure .460 Rowland. For something like a Glock though, the only change needed should be for a new barrel and heavier recoil spring. Currently, your choices for both conversion kits and new guns are limited, with Clark Custom Guns offering kits and Wilson Combat offering a 1911 in .460 Rowland. There’s also a new site up with conversion kits for some additional guns, including Glock and XD here. We had the Bazooka Brothers make an AR upper in .460 Rowland without any problem, and there have been rumors of other manufacturers keeping an eye on how well the public responds to the cartridge before coming out with their own models. The ammunition situation is even better: CorBon now offers five different loadings for the .460 Rowland, Buffalo Bore offers 4, Nosler has several, and there are any number of ‘custom’ ammo manufacturers who list the round. And of course, if you reload all your .45 ACP dies it will work just fine to reload the .460 Rowland, and there are reloading formula online at many sites. The .460 Rowland has been around for about 15 years now, only occasionally generating some interest from shooters and writers. Well, for good reason. I think the time has come to give it serious consideration because if you’re already carrying around a .45, it just makes sense to have the extra power of the .460 in the same package.